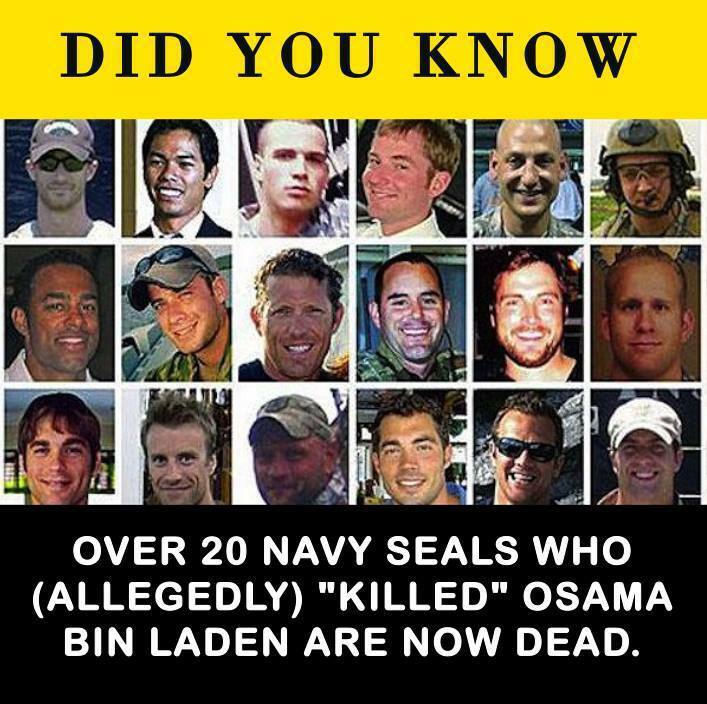 For those who don’t connect the dots, SEAL Team 6 was the unit of Navy SEALs that allegedly killed Osama bin Laden after a night raid of his compound in Abbottabad, Pakistan in May, 2012. As the news story was given to us, the team killed about five people in the room during the raid, then made off with bin Laden’s body and all of his personal papers and his computer. The body was buried at sea from a Navy ship, so the only proof of bin Laden’s death is in photographs of the body and his papers, which have been locked away in the pentagon and out of public view. For a long time we had no knowledge of the elite military group that carried out the raid. Then the information leaked that it involved 23 Navy SEALS. Most media outlets carefully excluded names of the men involved in the raid, but then Vice President Joe Biden revealed that SEAL Team 6 had carried out the raid. The BBC interviewed one alleged former SEAL who claimed that he was in on the raid. This man was no longer in the Navy and was working as a motivational speaker at the time of the interview. Then came the terrible news that the other 22 members of the team were killed when the CH-47 Chinook helicopter they were riding in was shot down by the Taliban over Afghanistan in August, 2011. Thus we have all of the makings of a conspiracy. We have the story of the killing of the most hated man in the United States, Osama bin Laden, the dumping of his body in the ocean, and the sudden death of all but one of the members of the raiding team that allegedly killed bin Laden. Except for the images, which could possibly be photo-shopped, and the records allegedly removed from the compound, but locked away from public view, there remains almost no proof that bin Laden was ever killed. Or that he wasn’t already dead before the SEAL team raided the Pakistan compound. Radical talk show personality Michael Savage is now stirring this conspiracy pot by proclaiming that the helicopter shoot-down that killed the team of men who killed Bin Laden was a government plot. "They were killed. They were assassinated. They were executed. Or was it done because there's a moron working inside the Defense Department who did it to them," Savage is quoted as saying. Savage is suggesting that the so-called Taliban shoot-down of the Navy helicopter in Afghanistan in August is "one of the greatest military scandals in American history . . . How could we lose more men in one mission than in the entire history of the Navy SEALS, and no one has been held accountable for it?" he asked. Savage said he learned in interviews with the families of the dead team members that after Biden made public their identities, they knew they were marked. Charles Strange, father of dead SEAL Michael Strange, allegedly told Savage: "They knew something was up. Every one of them." Thus we have yet another conspiracy locked within the overall conspiracy behind the 9-11 attack. Many wondered why President George W. Bush never put the hunt-down of Bin Laden high on his list of priorities after the attack, or why he called for military invasions of the entire nations of Afghanistan and Iraq instead of calling for a military action against the Al-Qaedia network. It also has been revealed that the Bush family has had close ties with the Bin Laden family and the oil empire in Saudi Arabia, where Osama bin Laden was born. Some say that Air Force One, which carried Mr.Bush from Florida to Washington on the day of the 9-11 attacks, made a few stops along the way to pick up members of the Bin Laden family and help them get out of the country. There appears to be much more to the Bin Laden story than we are being told.